Please note bookings are required. What did you think of Radio Rooftop Bar? The views are glorious and the drinks are strong and delicious! 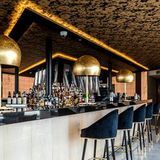 Radio Rooftop is a delightful bar at the ME London Hotel - the views are glorious, drinks are strong and delicious and the crowd when I visited were uber-glamorous and cool but friendly and unpretentious. We enjoyed a great afternoon - even though the weather was unkind. Very highly recommended. I visited last weekend with my wife after a recommendation from a friend but I hadn't made an advance booking as I was only planning on having a couple of drinks before dinner. I was surprised when we arrived that it took a bit of persuasion with the door staff but eventually we were able to get a spot at the bar as all of the seating areas were occupied. I just never expected it to be so busy on a Saturday afternoon! The cocktails were absolutely amazing and well worth the wait! One of the best whiskey sours I have ever tasted. The views of the London skyline are breathtaking, as you would expect. The 'VIP lift' was a cool extra touch too. Definitely a great spot to impress a date. Spectacular!! I am sorry to hear about Van View's experience of the booking policy for Radio but they don't really want organised parties. Anyway, I say get in there any way you can this summer, it is spectacular. Definitely the coolest rooftop in London just now! The food is great too, the KFC (not at all what you are thinking) is to die for! A must! London has one of the world’s best skylines, but beneath the tall buildings and eclectic architecture we barely even have the time to look up. 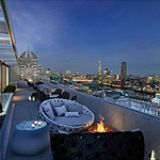 Now, Radio Rooftop Bar at the ME Hotel combines stunning views with cocktails, so there really is no excuse not to take the time to admire the capital’s finery. Radio Rooftop Bar is all about the fantastic, breathtaking views. Located 10 floors above London, they could have thrown out some hay and a couple of cardboard boxes and people would have still been impressed. Luckily, this hasn’t been done and despite any possible temptation to be lazy, the hotel has really gone for it on the design front. 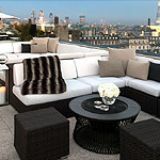 As well as almost 360 degree views of the River Thames, Shard, Tower Bridge, St Paul’s and even the West End, you also get the visual feast that is the Radio Rooftop Bar décor. The theme is pure, unadulterated glamour. Low white cocktail tables mix with white leather sofas, simple tiling and small open fires for those chilly London nights. It’s not so overt that it’s tacky, but the clean lines and simple colours create an air of sophistication. Some of it is under cover in case, as is inevitable, the summer fails to live up to expectation or for when you decide that you have hidden your fabulous outfit under a coat for quite long enough. Radio Rooftop Bar is a place where the beautiful people come to see and be seen. However, despite an underlying sense of trendiness, there isn’t too much in the way of overt arrogance. Table service makes the need to crowd into the bar obsolete so, if you are lucky enough to nab a table, you can pretty much settle in for the long haul. Music plays in the background to give a laid-back club vibe akin to that of Ibiza, and it feels very much like the place to come for a sophisticated party. It also makes for prime photo-taking opportunities, whether you’re a tourist or a die-hard Londoner. Cocktails are the order of the day at Radio Rooftop Bar, and they have really pushed the boat out by getting the One Group involved. The result is inventive signature concoctions that are more exciting than sipping on a plain old Mojito. They have also been smart in tying in some of the cocktails with the feature of this bar – the fantastic view. The cutely named Mile High Margarita, for example, mixes Jose Cuervo Gold, Grand Marnier, Cointreau and Chambord for a potent drink. This is toned down with a mix of cranberry juice and lemonade to make it refreshing and almost too easy to drink. Alternatively, the Electric Light Company mixes Champagne with gin, mint and lime. The bubbles add a nice dimension to the light flavour of Bombay Sapphire and it’s given a pleasant, fresh lift thanks to the mint. A squeeze of lime cuts through it all with a slight tang for an incredibly well balanced drink. Radio Rooftop Bar could have easily relied solely upon its striking views to make an impression. Instead, it has gone all out with an aesthetic designed to high specification and an inventive choice of cocktails. Just be prepared for the summer rush.